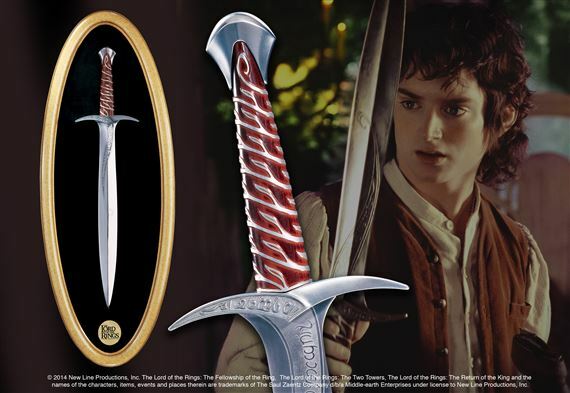 Made with the highest quality standards, this official reproduction of Sting, the sword of Frodo, is available only from The Noble Collection. It is a full sized sword that measures over 27 inches in length and is made to the standards that are only found in the most sought after European collectibles. Crafted by master sword makers in Toledo, Spain, exclusively for The Noble Collection. The handle is in bas relief and is hand enameled. This exquisite collector piece comes complete with an official, "The Lord of the Rings" plaque (measuring 37 inches) and is accompanied by a Certificate of Authenticity from New Line Cinema. Swords may not be sold to consumers under the age of 18.